Another season is coming to an end. I was proud to compete at USA Championships, race across Europe, and represent the USA at the NACAC Championships in Toronto. But now, the FUN begins and I get to place my passion into my calling as an athlete. On any given day you might see me strolling around in orange jersey supporting my hometown team. You all know I am a huge Syracuse fan (Mama Rogers raised all of her boys well!!). But this time of year, I have another reason to get all painted up in Orange-- HOOD TO COAST 2018 with World Vision 4 South Sudan! It is time to paint Portland orange again this year with the ten crazy passionate, fast running, world changing teams that have shed blood, sweat, and tears to change lives in South Sudan. This is our 6th year running HTC World Vision 4 South Sudan - all that dedication has translated into over $3 MILLION dollars for the people of South Sudan. In a time when the young country is still struggling to gain its balance, the HTC 4 South Sudan runners have brought hope and light to the most vulnerable. This is powerful! But I need your help!! I am a team captain again this year and raising money to change lives - run along me and donate to touch the lives of thousands of children in South Sudan! Join our team, be part of the passion, and be that hand that reaches out to a young girl or boy just like me in the moment of my deepest need. A little boy who would become an Olympic athlete is flying—running as fast as he can barefoot, kicking a soccer ball on a dirt playing field at a refugee camp in Kenya, aiming for the goal. The future 1500-meter champion is called to the sidelines and the ball is taken away. He walks dejectedly to his new position—as goalie. A striker, in soccer speak, is the player who scores the goals. They’re called forwards or attackers as well. Though the team plays together, the strikers get the glory. So Lopez would play as a virtual one-man team—speeding up and down the field with the ball, stealing, scoring, and getting all the glory. Lopez learned to be a goalie. The goalie is the consummate team player. As a goalie, you need to motivate your teammates. You are the last line of defense in a game. You have to keep your eye on the action all the time and be in constant communication with your teammates. Since that time, Lopez has become two things: a great athlete and a man who shares. Lopez gives back. He came to the United States in 2001 as one of the “Lost Boys of Sudan”—a product of the civil war in Sudan—taken in by loving foster parents. Although he feared his parents in Sudan had been killed, he learned that they were still alive and was able to contact his mother by cellphone. Reunited in Sudan with his parents for the first time, 17 years after he had been abducted from his mother’s lap at a church service, he saw the needs of his country with new eyes. Today, Lopez is a tireless advocate for the people of South Sudan—the newest country in the world, gaining independence from Sudan in 2011. “God keeps blessing me,” he says, “I want to go and try and raise as much money as I can.” Money for clean water, healthcare, education—for people who are starting from scratch. “I want to do more with World Vision,” he says. World Vision has worked in Sudan since 1972—and South Sudan since its independence in 2011—bringing relief and supporting the local church. And when Lopez sets his mind to something—it happens. There is something very special about every Olympic athlete. Gymnasts such as Simone Biles and swimmers such as Michael Phelps do what seems to be the impossible. Kerri Walsh Jennings plays volleyball in sand! I can barely walk in sand. Ashton Eaton and Brianne Theisen aren’t only the best at what they do—they’re married to one another. It’s mind-boggling. But as I watch the Olympics, I cannot help to think about Lopez’s story and how he learned the greatest lesson of all: living to share. For it’s not whether you win or lose, but how you play the game. 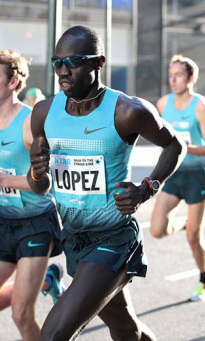 Lopez learned that early in life in a refugee camp in Kenya, barefoot on a soccer field. He will be remembered not just for his victories on the track—but for the broader journey of his life—a life lived for others. Let's Roll - Outdoor 2015! It's been many month's since I have last written so let me catch you up on life since September. Let's start with the BIG change - getting married! I know everyone says that you don't remember your wedding day and that it all goes by in a blur, but let me tell you, those moments with our family and my new wife will never get blurred. Huge shout out to Britt and both of our amazing families for making the day one of the most memorable in my life! But when the bells go quiet, the cake has been eaten (pecan frosting - yum! ), and the last dance has played (Angel by Sarah McLachlan) it is something like the feeling you get when you run through the line at the end of an Olympic 5K. No, seriously! It's exactly what it feels like! You have been planning for this moment, training, visualizing it again and again, and then there you are with arms outstretched, taking a big breath and trying to memorize every little thing about it. When you cross that Olympic finish line you feel the exhaustion, relief, runner's high. Gosh, I love those feelings! Every bit of it. So with the overwhelming happiness that all newlyweds have, we boarded a plane and traveled for 24 hours to Australia. We both got middle seats 20 meters apart... romantic, right :-/... but I guess we can't complain about free flights from cashing in airline miles. So, groggily, we stumbled into Sydney. And it took our breath away! This city is AWESOME... why can't it be 24 hours closer. Harbor tour on a 100 year old ship, The King and I at the Sydney Opera house, runs through the botanical gardens, Darling Harbor, Sydney nightlife, afternoon Tea at the Victoria building... I could have explored that city for years! But we kept marching on, and a week later we found ourselves in Adelaide, where Brittany will be assigned late this year. In the same way we were awed by Sydney's over-the-top sparkle and character, we were awed by Adelaide's down-to-earth living. We strolled to the Central Market each day to pick up ingredients for Ugali - fresh Kale and wild kangaroo meat (I know, they are so cute, but a man's gotta eat!). We toured the Adelaide Hill's nature reserves and wineries and connected with Aboriginal culture (Brittany picked up some new painting inspiration and I am working on my didgeridoo skills). Can't wait for the exciting new adventures Down Under during my off season! But, before I get carried away dreaming about dingos and Tasmanian devils I'm BACK TO THE TRACK!! After a short but fun indoor season, outdoor starts on Friday at the Mt. SAC Invite. I am racing the 1500m at 6:39PM and can't wait to be out in the open air, running in the beautiful California sunshine with the Bowerman Track Club. Next up is Stanford Payton Jordan Invite on Saturday May 2nd. Time to light it up and set the stage on the way to IAAF World Championships in Beijing, China. Come cheer me on in California!! Just 20 Days away - It's becoming REAL people! A few weeks ago wedding pews, centerpieces, bow ties, playlists, and party favors were dreamlike imaginings... Now the suits are pressed, hanging in my closet, the plane tickets and hotel rooms are booked, and I know more than I could ever wish to know about the minutia of party planning... napkin folds?! Seriously!? But honestly, I am STOKED!! Britt has been a champion in planning so much of our special day. I am doing exactly what a good fiance should do - "Yes Honey, that's exactly what I wanted... couldn't have chosen any better myself ;)" And the best part is we are in the final stretch --- I am down to my LAST 2 races (Berlin and Rieti) before I stand at the end of that aisle waiting to recite those vows. Homestretch, right?! But this wedding is more than just a lovely day spent with friends and family. For Brittany and I this is a day where we get to celebrate our devotion to one another but ALSO our devotion as a couple to making a difference in the world. In so many ways our relationship started through running and then flourished through our joint passion for charity. For us, CHARITY is synonymous with LO﻿VE! We hope that this union is further celebrated by lighting a fire of compassion in those around us! Instead of gifts we are asking for our friends and family to memorialize the special day by touching hundreds of lives in East Africa. We are supporting the Spark a Brighter Future project through World Vision which will provide digital education tools, internet connectivity, and training to students and teachers at schools in Kenya. More than just providing access to educational resources, this project will empower children to DREAM bigger and CONNECT to a world of possibility. During my 10 years as a refugee in Kenya I yearned for the opportunity to go to school and pursue my dreams of having a better life. My friends and I wrote the alphabet in the sand of the refugee camp and dreamed of having a pencil and paper. My life changed when I got the chance to write my story down and submit it to the US embassy for a chance to build a better future in the US. With your help Brittany and I want to make sure that every child has the opportunity to write down their stories and pursue their goals in education. 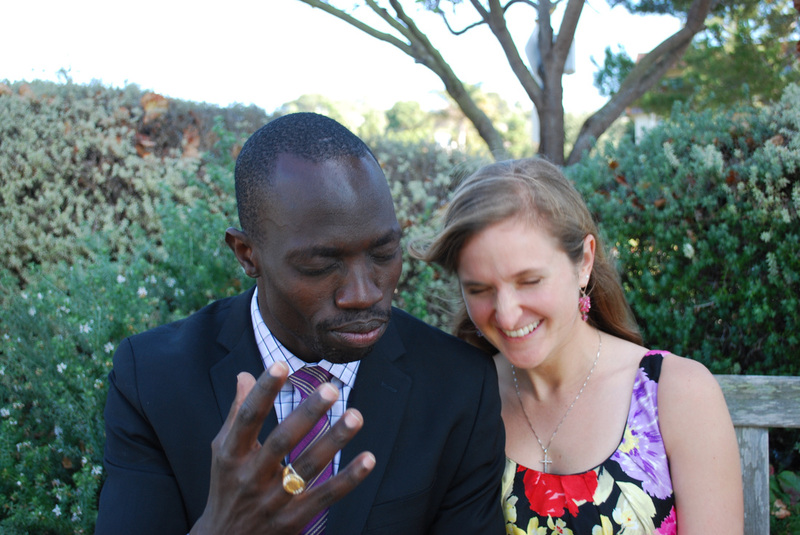 Education has changed both of our lives and we hope together we can celebrate our marriage by changing the lives of hundreds of children in East Africa. If you want to be part of our special day and help us SHARE THE LOVE with hundreds of children in East Africa, please visit our Wedding Giving Page! 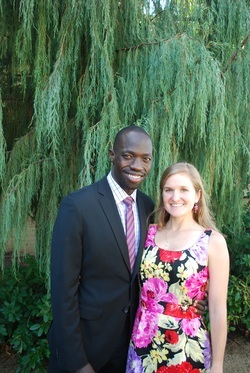 Thanks for all of your prayers and thoughts on our special day - I will be dancing down that aisle! CLEAN WATER ICE BUCKET CHALLENGE! It's finally happened - Brittany and I have been challenged to the ICE BUCKET CHALLENGE! We taking the challenge for CLEAN WATER in South Sudan. Just $50 provides clean water for life for ONE child in South Sudan! Take the clean water ice bucket challenge and help us save lives!! Donate to our Hood to Coast event or to Team World Vision for South Sudan! This is a weekend to remember for so many reasons. Some moments thrilling, some devastating... this weekend was one of emotion and everyone agrees that this weekend is one that defines the future of track and field. The weekend started off with a trip to Albuquerque which is almost a homecoming for me as I get to visit Brittany in her hometown and race in front of a crowd of friends and family. Coming into this weekend, I imagined it would be one that exhibited the greatest American track had to offer and a joyful reunion of athletes and family. I started off with the 3000m. Over the last few years I have been training to learn how to transition from mid to longer distances and this was another step on that journey. I had the chance to compete with an incredibly large field (20 athletes all racing on a 200 meter track- unbelievable!!) but unlike most championship races it was an hard, HONEST race. I truly commend my teammate, Andrew Bumbalough (Bumbi), for his couragous racing and putting it all on the line. Nobody could capture it better than my teammate, Ryan Hill - "Bumbi wanted to go out hard... well [Shoot]... He's our teammate... Let's just do this like a team would do this...". And I am so proud that Bumbi took the race at an honest pace and should be recognized for his hard work and a brave race plan. I finished a somewhat disappointing 4th, as I had hoped to make the team in the 3000m (only top 2 go to World Champs) but I was overwhelmingly proud of the tough racing of my younger teammates. They inspired me to look to the 1500 meters the next day not just as an athlete but as a warrior fighting for the purity and transparency of our sport. I grew up in Africa where I fought daily with corruption. For ten years I struggled to survive in a refugee camp in Kenya, eating rubbish, and learning to work with together with friends to make it through the good times and the bad. We ran to keep our minds away from depression and hunger - it was our salvation. To have the opportunity to run full of joy and represent the greatest nation on earth has been a blessing in every way. Every time a tie up my shoes and run on the beautiful trails in Portland I am reminded of the blessing of second chances and redemption. So, this weekend when I laced up my spikes and stepped onto the track for the 1500 meters I ran with only joy and for the virtue of the sport. I expected a tough race and respected the talent of all of my competitors - whatever the outcome of I would have been happy. When I broke the tape at the finish line I was realized why I do this sport - to wear the jersey of a country that good and honest and inspire a young generation to fill our shoes and be good roles models. Hard work pays. 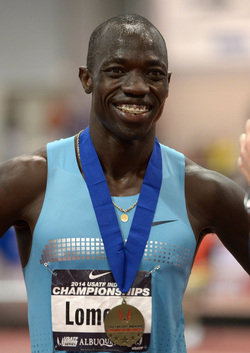 Thank you for all of the friends and fans who have shown support for what I represent on the track. Keep in tune for the indoor World Championships in Sopot, Poland, from 7 - 9 March 2014 and send up your cheers for Team USA!! GO USA!! Let's continue making history!! Outdoor Opener - Come cheer me on in San Diego on Cinco de Mayo! After a month of very hard work in Mammoth Lakes, CA, we have finally reached that critical moment - the start of outdoor track season!!! I am so sorry about missing a few weeks of blog posts - between the tough track workouts from Coach Schumacher, the killer core from Pascal, and the endless time in recovery, it seems like just a blink of an eye since I arrived here exactly 1 month ago. Training at high altitude has been great but the best part of training camp is the chance to train with the worlds best distance runners. Just wanted to give a shout out to all of my teammates who have been pushing me through all the tough workouts - you guys are amazing! Running Tip #8: Racing is part physical and part mental strength. The mental strength is key to performance. Rid yourself of any negative thoughts and watch your performances soar! This marks the start of the 2013 outdoor season and a chance to chase after new personal records and the dream of bringing a medal back to the U.S. from World Championships in Moscow, Russia this summer. I am so blessed to be healthy and able to train at my peak. Thank you for your cheers on the track and for supporting me in the work that means the most to me - changing lives in South Sudan! 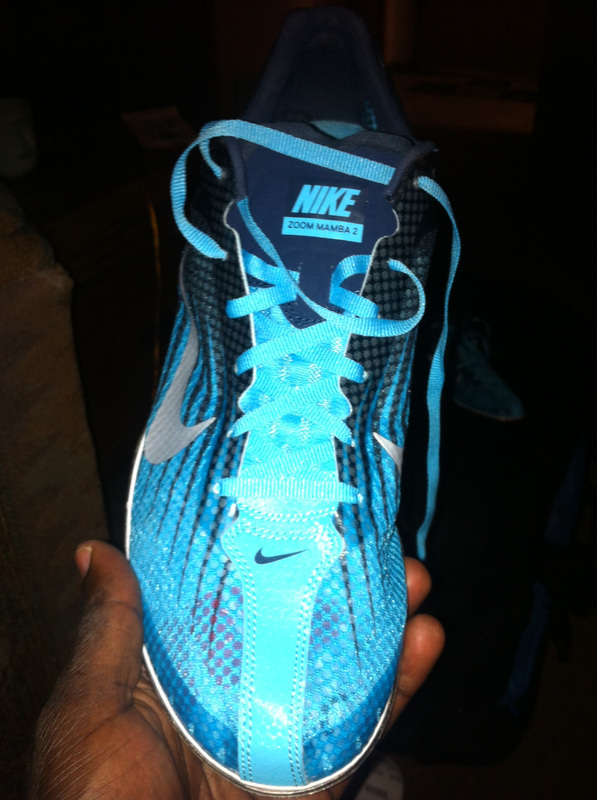 I am ready to charge into the 2013 outdoor season and change the world one race at a time... LET'S GO!